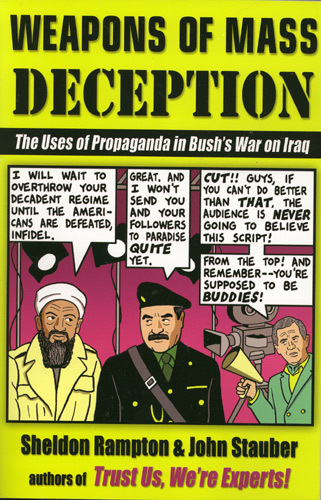 WEAPONS OF MASS DECEPTION reveals how the Bush administration used Madison Avenue advertising techniques to sell America on invading Iraq, with intensive planning for the Iraq rollout starting in the summer of 2002, followed by an autumn marketing campaign carefully orchestrated by the White House. Media critics John Stauber and Sheldon Rampton, founders of PR Watch, document the doublespeak, manipulation of fear, reliance upon the right-wing media "patriotism police", and outright propaganda to lie its way to war. Also revealed is how TV broadcasters relied upon the Iraq invasion to boost declining viewership, how corporations and industry groups used post 9/11 fears and the Terror War to limit the public's right-to-know about health risks, and more.